David Gell Brushes are Here!!! I know…I have been a very bad person and neglected my blog…sigh. And at least a year ago I promised to post brushes created by David Gell, who I consider to be the best brush master ever. Many of David’s brushes were on his site, JitterBrush, but he took the site down and his variants were not available on-line. He did give me permission to post all of them for you. Well…since today is my birthday, I thought I would pass David’s gift to my blog readers. I know, about time, right? I have followed David’s Painter tutorials since I started using Painter and most of what I know about brushes comes from his generous sharing. I created a David Gell Brush library so that I could have all of his variants in one place. This library contains 28 brush categories and some of them are quite old and haven’t been available for some time. But, I have always loved David’s variants, old or new, so I have kept them over the years. With many thanks to David; here is David Gell Brush Library. To install these brushes, first download the above file and save it to your computer, then open Painter, go to the Menu Bar and select Brushes > Import > Brush Library and select the downloaded file. Please note, the installed file is a separate library. You will need to switch back and forth between libraries. Some of David’s brushes are pretty complex and need a bit of explanation. As time permits I will post tips. Many folks have requested Suminagashi 2 category included in the library. I thought I would give you a few tips copied from David’s JitterBrush site about those variants. The color rendering Suminagashi and Suminagashi Grad variants can produce a very fluid, ethereal look, even without the aid of softening or distorting variants. Variants with Grad in their name take their color information from the currently selected gradient, while other variants employ color variability via the Color Variability palette. For this image, I have chosen Suminagashi Grad B variant with Rainbow Pinched gradient. Variants in this library prefixed with a Z in their name do not apply any color of their own, but distort the underlying imagery in many ways. Comparing to the traditional Suminagashi technique, this would be the closest equivalent to disturbing the surface of the floating ink media so that the different colors and regions begin to mix and flow into each other. For these particular variants, David configured them so that stylus pressure controls the magnitude of the distortion effect. I used Z Takayama variant to distort the first image in this post. Floranagashi left, Grainagashi bottom and right side. Image first filled with two point gradient. The Floranagashi variant can produce a sumi-e style branch and foliage effect, while the Grainagashi variant interacts with the currently selected paper texture. The Z Grainagashi Smear variant does not apply any color, but smears the underlying pixels determined by the current paper texture. For this image, I filled the canvas with two point gradient. I created the bottom and right side of the image with the Grainagashi variant using Madness paper texture. The branch like strokes on the left used the Floranagashi variant. Use undo and redo to achieve the desired look with these variants. With a little trial and error, they can produce dragon-like forms, even complete with heads. In this example, I used the Fuku Riu (Good Luck Dragon) variant for the top stroke and the Sui Riu (Dragon King/Rain Dragon) variant for the bottom stroke. The strokes produced by the Life Form and Life Form Mono variants appear alien, hence the name. The Color Variability Panel randomizes the colors/values within the strokes. Use a slower stroke speed to produce a more closed, tubular form, and faster strokes to give a more open “backbone” effect. In this example, I used Life Form for the top stroke and Life Form Mono for the bottom stoke. I altered the velocity of the stroke to showcase the different look at different speeds. In case you didn’t know, Suminagashi is an ancient Japanese paper marbling technique. Google it and learn more, there’s even a few videos about it on You Tube. Other groups of people used the same techniques. I am especially fond of Ebru. I think I have some videos somewhere, probably You Tube, about making Ebru like images in Painter. Check it out. OK, that’s it for this post. I hope you enjoy David’s variants. I know I have. And once again, David…thank you so much for your generosity. David Gell, a Master Painter Brush Maker, long time supporter of Corel Painter, and mentor to many of us, closed Jitterbrush, his wonderful website. It was full of wonderful information and incredible brushes. Before closing David told me that I could download anything and put it on my blog to keep it available for Corel Painter users. 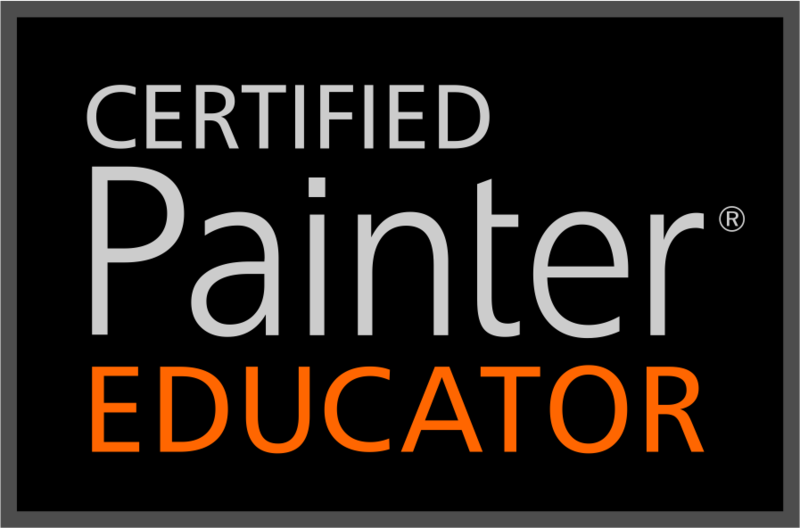 I must say, David, I can’t tell you how honored I am to help keep your incredible work with in easy reach of new and advanced Painter users. You have helped so many of us for many years. David planned to close his site on July 9, 2016 and I was going to start putting the information on my site at that time. Unfortunately, my sister fell and developed a massive hematoma on the left side of her brain on July 8th and I had to go to Mississippi to help with her care. I have been gone for 3 months and all the material from David’s site was still in Georgia. I returned to Georgia last week, and I decided to start the project today. I plan to add little by little until it is all here. The same rules apply for any of the downloads available. There are no restrictions on use, other than the resources are not to be offered for sale or shared without my prior consent. The above image demonstrates some of the brush strokes possible using the Tribal Beads and Weaves Brushes. The Tribal Beads and Weaves brushes for Corel Painter 12.2 and above have been primarily developed to quickly place a repeating jewellery element in your compositions. Beaded Braid 3 Strand, Beaded Braid 5 Strand, Beaded Braid 7 Strand, Beads 1 String Dab 1, Beads 1 String Dab 2, Beads 1 String Dab 3. Beads 1 String Dab 4, Beads 1 String Round, Beads 3 String Dab 1, Beads 3 String Round, Beads 5 String Dab 1, Beads 5 String Round, Beads 7 String Dab 1, Beads 7 String Round, Sequin Braid, Tiny Bead Necklace, Tribal Weave 1, Tribal Weave 2, Tribal Weave 3. Here is a quick video showing the brushes in action. If you choose to download the Category, download and save the Tribal Beads_Weaves.brushcategory “as is” to your computer. Open Painter and go to Brushes > Import > Category and click open. The category will load in the currently active Library. If you choose to download the Library, download and save the Tribal Beads_Weaves.brushlibrary “as is” to your computer. Open Painter and go to Brushes > Import > Brush Library and then click on the Tribal Beads_Weaves.brushlibrary file. It will create a new library with Tribal Beads and Weaves loaded. Enjoy your gift from David.